This article is from the Sep.–Dec. 1994 AFRMA Rat & Mouse Tales news-magazine. The ever-growing and changing relationships among the rats in our family are a source of much interest and amusement on the part of the human members. More than anything else, we have been impressed by the way rats raise their young, treat their elderly, and handle disputes with a level of intelligence, affection, and fairness that seems to be beyond the capacity of our own species. We never intend to breed our rats, but because we have adopted three as babies, we have had the opportunity to observe the way adults deal with youngsters as well as with each other. Phineas, 14 months old and mistreated before we adopted him, was terrified of us and his new surroundings, but equally terrified of being alone for the first time. We rushed out and got him a baby rat, Fergus, whom he welcomed with almost pitiful joy. Immediately Phineas began showing Fergus how to behave, which foods to eat, and how to handle himself. When Phineas drank from the water bottle, Fergus tried to horn in every time. Patiently but firmly, Phineas held Fergus’ head down with his hands and drank as if the little guy weren’t even there! In this way, Fergus learned to wait his turn. Phineas groomed Fergus in a friendly way and was groomed in return, and Phineas often allowed Fergus to play with him and bounce around as babies will. But Phineas also rolled Fergus over and made him say “Uncle” with some regularity. This is a rat’s way of asserting himself and establishing who is “head rat,” and it occurs even with rats who love each other and are friends. Far from causing problems in their relationship, Phineas’ little reminders served to keep the boundaries clear for Fergus, who never seemed upset by the discipline. 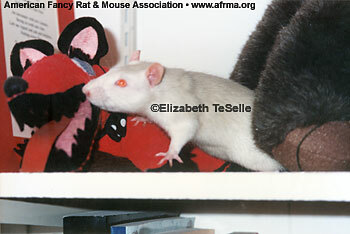 Interestingly, even since it has became clear that Fergus is now top rat, he has rarely asserted himself with Phineas. Perhaps Phineas handed over the reins willingly, since he was getting on and preferred to take it easy. 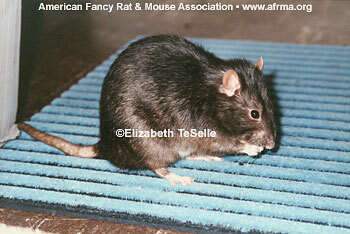 And of course, we have had far less aggression since the younger rats were neutered. But whatever the reason, the exchange of power seems to have been carried out amicably, and Fergus still defers to Phineas politely, as if to an aging patriarch, even as he makes demands of the other rats. Always solicitous of Phineas’ needs, Fergus makes sure someone stays with the old guy most of the time, grooms him gently, and keeps the younger rats from getting too rowdy around him. Far from abandoning Phineas because of his age and infirmity, Fergus seems to understand his friend’s reduced abilities and compensate for them. When we introduced Tristan (still a baby at 3 months and recently neutered) to neutered Fergus and intact Phineas, Phineas was pleasant and kind to the new kid, but Tristan was adopted almost instantly by Fergus. Similarly, when we introduced baby Fiona (only 6 weeks old) to the three guys, Phineas seemed only mildly interested and Fergus behaved towards her like a kind but preoccupied uncle, while Tristan took her under his protection at once. In fact, even though Tristan had been neutered for 7 months at the time of Fiona’s introduction, it became clear at once that their relationship was a little more intimate than that of uncle and niece! Unlike Phineas and Fergus, who gently disciplined their respective baby rats and taught them the boundaries, Tristan seems to be spoiling Fiona rotten. Tristan lets Fiona harass him endlessly and push him away from food and water. In fact, early on in their relationship, when Tristan was trying to push Fiona down and discipline her, Fiona reared up on her tiny baby legs, grabbed a hunk of fur on Tristan’s cheek with her little hand, and shook him! Tristan seems to love her all the more for her assertive personality. 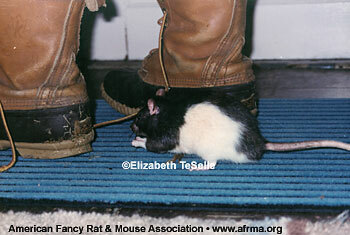 This is, perhaps, because she is female and not subject to as much “dominance” behavior as a male rat would be. Whatever the reason, Fiona has become an extremely confident rat who thinks that everyone (the other rats and we humans, as well) owe her something most of the time! The day Fiona moved into the boys’ large cage, she and Tristan were especially excited, and it was comical watching them chasing each other and wrestling. This went on for some time, until Fergus apparently decided he had enough of the high jinks. As Fiona sped past him with Tristan in hot pursuit, Fergus stepped in front of Tristan and extended his arm so that his hand was on Tristan’s forehead. As clearly as if he had spoken the words out loud, this gesture seemed to say, “Cool it, Tris.” And Tristan immediately settled down (for a while!) and stopped chasing Fiona. It was then that Marc and I realized that little Fergus had really grown up into a responsible rat. Stories like these abound in the homes of people who live with rats, and perhaps our experiences are not all that uncommon. But as we see the relationships between the rats growing and changing as they adjust to a new baby, to Phineas’ aging, to the passing of the torch from Phineas to Fergus, we are amazed almost daily by the complexity—and at the same time, the simplicity—of their social structure. Complex because all relationships between thinking individuals are complex, but simple because so clearly fairness and justice are at the heart of it all. 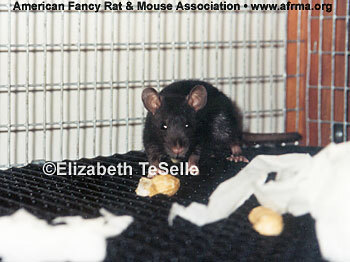 We have never seen the rats be deliberately cruel, gang up on a weaker rat, or abuse or ignore a baby or an old rat. Perhaps because the males do not have hormones to contend with, their true natures have been able to come out. All we know is that compared to them, we feel very humble indeed.